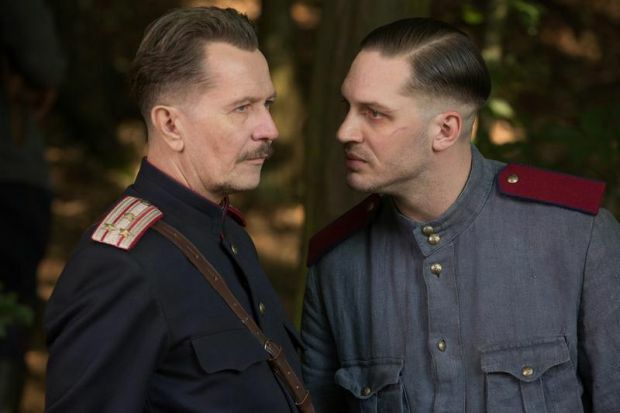 NEW YORK (CNS) — The Stalin-era crime drama “Child 44” (Summit) is, alas, as murky as Siberian mud. That’s too bad, because the premise of the Tom Rob Smith novel on which the film is based — the first volume in a trilogy of thrillers — is sound. In the Soviet Union in 1953, a serial killer is stalking young boys. The added twist in what would otherwise be a routine procedural is that such crimes can’t officially exist. In fact, even reporting them goes against the party line because such deaths are viewed as a uniquely capitalist problem. This clash of vile reality with the state-enforced psychological unreality by which it must be ignored has potentially intriguing consequences. Everyone involved creates a web of lies, making for a multilayered plot that, in a better-crafted movie, would provide suspense — and, perhaps, a few moral lessons about life under tyranny as well. There is at least an effort to provide context. In order for the audience to understand how these characters have been formed by cruelty, we’re given glimpses of Stalin’s manmade famine in the Ukraine of the 1930s. The devastating legacy of World War II is also referenced. None of it works. Director Daniel Espinosa and screenwriter Richard Price get bogged down in details, subplots and stereotyped apparatchiks — so much so that the picture appears not to move at all for the nearly unwatchable first hour of its daunting 137-minute running time. Tom Hardy is Leo Demidov, a state security officer who was orphaned during the Ukraine disaster, and is now attempting to investigate the murders. His wife Raisa (Noomi Rapace), a teacher, has her own complicated past. Demidov is exiled from Moscow when he finally makes progress on the case. Even then, however, he can’t let the killings go. He gets help from sympathetic Gen. Mikhail Nesterov (Gary Oldman), but is constantly harassed by Vasili (Joel Kinnaman), a fellow security officer who wants to keep the crimes concealed. In a somewhat ironic, not to say Orwellian, development, “Child 44” has been banned from theaters in the Russian Federation as well as in other successor states to the Soviet Union. The objection seems to be the negative light in which numerous characters are shown. Apparently, there were no bad guys in paradise either. The film contains gun and physical violence, a fleeting scene of semi-graphic sexual activity as well as occasional profanity and rough language. The Catholic News Service classification is A-III — adults. The Motion Picture Association of America rating is R — restricted. Under 17 requires accompanying parent or adult guardian.